@BifBangPow: Rocker Scott Ian Inks Licensing Deal with Bif Bang Pow! Rocker Scott Ian Inks Licensing Deal with Bif Bang Pow! LOS ANGELES, CA – Scott Ian, co-founder and rhythm guitarist of the seminal heavy metal group Anthrax, just signed a licensing deal with toy company Bif Bang Pow! to produce action figures and bobble heads in his image. Following the company’s success with collectibles from films (The Big Lebowski and Flash Gordon: The Movie) and television (Showtime Network's Dexter), this marks BBP!’s first plunge into the world of rock and roll. "I'm really excited to be working with Bif Bang Pow! on what is to be my first action figure," says Ian. "The same people that made the Lebowski figures want to make one of me. That's sick!!! No desk will be complete without one!" 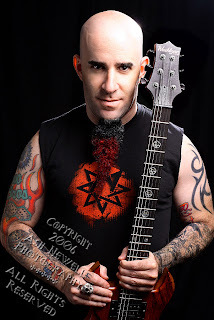 Says Jason Lenzi, CEO of Bif Bang Pow!, "Scott Ian is obviously a legendary musician and well-known personality, but he's a genre fan as well. I think he's perfect for BBP! 's growing roster of unforgettable characters." Working closely together, Bif Bang Pow! and Scott Ian have announced their first product, a bobble head, which can be pre-ordered now. The Scott Ian Bobble Head is scheduled to ship sometime this summer.